Like Anime Expo a couple of months ago, my Toyota Corolla, nicknamed "Miku-chan" for the design that matched the 2011 Corolla + Miku ad campaign, would be the method of travel. Yes, flying out to Las Vegas to Sacramento would of made better sense, but cost-wise it was much cheaper plus it allowed us to see more of Vegas without resorting to mass transit. Day Zero began very early, also like Anime Expo, to the tune of Ryan, Amanda, and Dalton arriving in Sacramento shortly after 2:00am Thursday. This time, the agenda was simple: load up and get out of Sacramento. We left for Las Vegas around 2:30am, taking Interstate 5 to Stockton then Highway 99 to Bakersfield. We were making good time since we got there around 6am just in time to see the sun rise over the Mojave as we gunned it through Highway 58 and Interstate 15. In the backseat, me and Dalton kept relating our drive to Fallout: New Vegas and the accuracy of the game versus the real-world. At least we were driving and not walking like in the game. I was shocked to noticed that we arrived in Las Vegas shortly after 10am with ample time to spare before check-in or badge pick-up. 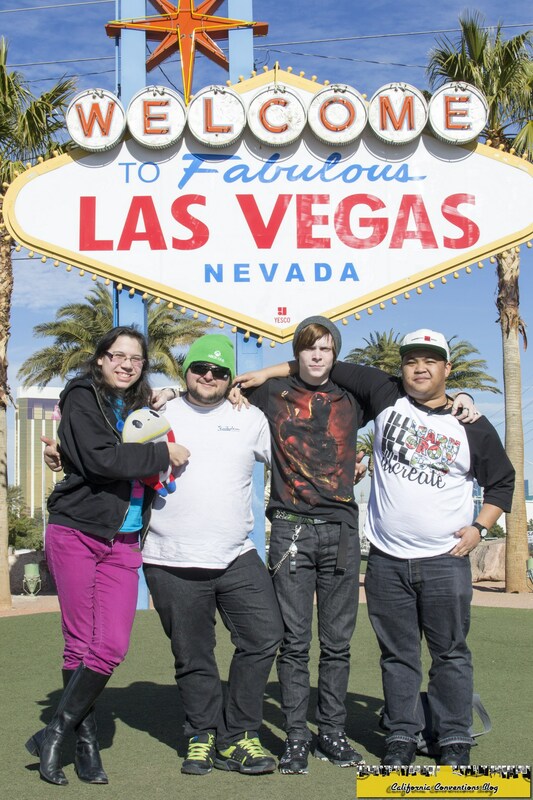 To kill some time, we first visited the Welcome to Las Vegas sign where we got our first photos in. After that, we scouted places to eat while we wait for 4pm. Our search first took us to Town Square Las Vegas just south of McCarran International. Here, the realization that everything is more expensive on this side of the Strip started to hit when Panda Express was $2 higher than typical prices back Sacramento. At least this wasn't as bad compared to the Miracle Mile Shops at Planet Hollywood where it was $3 higher. Other staples like Jamba Juice and Subway had premiums on them just because Las Vegas can. Also located here at this shopping plaza was Anime Revolution which I had heard about through websites like Anime News Network. It's probably one of the nicest upscale anime stores that I've seen and they had some nice merchandise for sale including cosplay and wigs. It would of been nice to make a detour from the convention like watching the Blue Man Group or Criss Angel. But even with the discounts, it was still way too expensive. A quick Google search found us a Panda Express with non-inflated prices across the freeway, but that all changed when a Popeyes showed up. Everyone was consent on Popeyes, and those three got to eat at a place that they don't have in Oregon while I got my sweet tea fix on. Ironically, it was the same drive that I took back at Anime Vegas to fetch pizza for the Code Geass lunch. With nothing else to do, we finally parked at Bally's to either pick-up badges, check-in, or both. As we walked through Paris Hotel and Casino and used the restroom on the convention center floor, Dalton was in shock and awe over the beauty and sheer glass canyons that was Las Vegas. 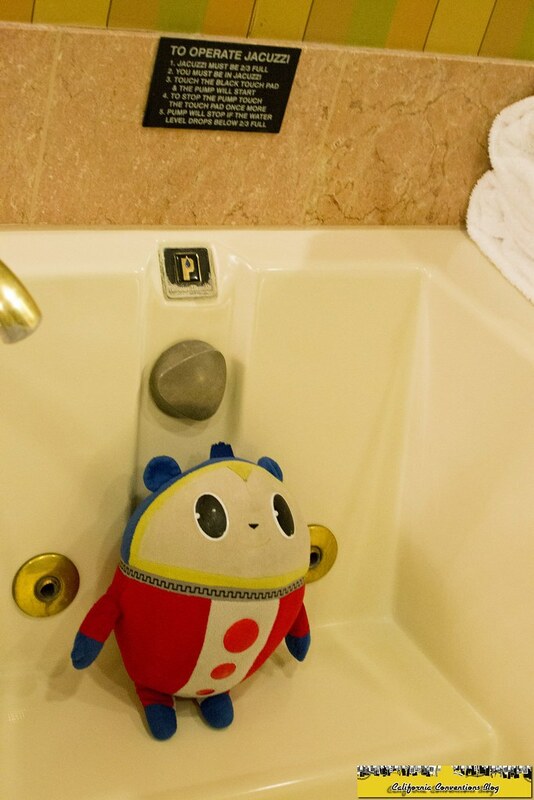 Then we realized that this is where EVO 2013 took place. Instantly, we could all hear the echoes coming from the halls of Justin Wong making his run and Infiltration making his Hakan counter-pick against PR Balrog. As we walked into Planet Hollywood, we knew that this convention was going to be good. The convention itself was upstairs away from the casino floor with a balcony to watch the gaming action below. The convention was in its early stages of set-up and badges weren't ready yet. This gave us an opportunity to finally sit down and rest our legs. By then it was 2pm and according to the casino electronic board the press room was open. I stopped in to see if I could get my badge before 3pm and because they were there, I got my badge. After that, we toured the Miracle Mile before walking back to Bally's to check-in. According to what I've read, the best time to check-in and ask for an upgrade is later in the day when the hotel knows what's available. So I asked for what they had, and they said that they had a suite with a jacuzzi available for $100 per night more but got it knocked down to $50 per night when I showed my Total Rewards Card. That's $200 more for the entire convention, or $40 more per person. They even threw in a roll-away bed for free. We were set for this convention. The nice part about our room was that our elevators bypassed the first 15 floors. 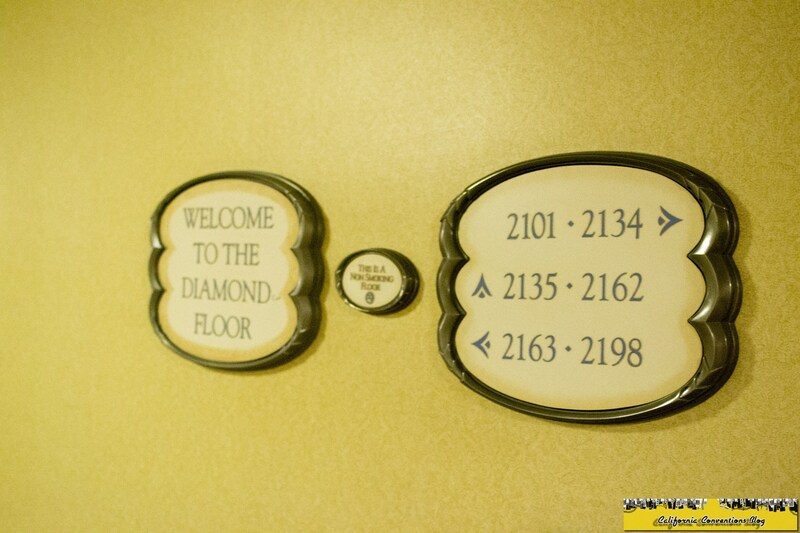 We were on the 21st floor in room 2134. As we got in, our jaws dropped over the size of just about everything. And everything worked this time around: Ryan got his Xbox One to hook up to the TV and later on in the evening we were able to play Killer Instinct from the jacuzzi. After grabbing everything out of the car and obtaining valet at the hotel, they were ready to pick up badges. But mother nature had other plans in the form of a Nor'eastern that shut down the East Coast. Much of Otakon Vegas' supplies came from their home base in Baltimore, and a package containing their badges and related material got delayed in the storm. At the time, their Facebook page said that they would update throughout that night but never did. So for the time being, there was no pre-registration badge pick-up. 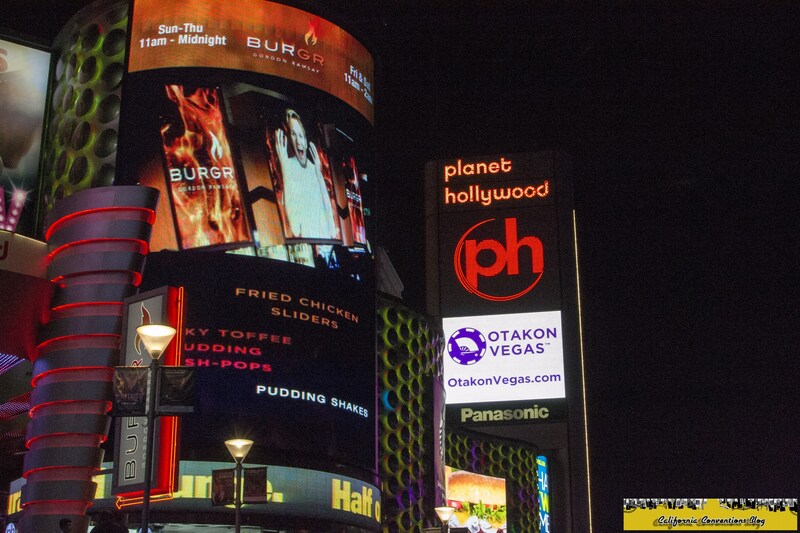 Outside the casino, every once in awhile the promo video from Otakon Vegas would show up on the marquee. In a sea of screens and neon lights, it was neat to see something that related to me right on the strip. Hungry, we set out to Vons and Little Ceasar's near UNLV. We stocked up on breakfast and snack food as well as pizza for dinner. 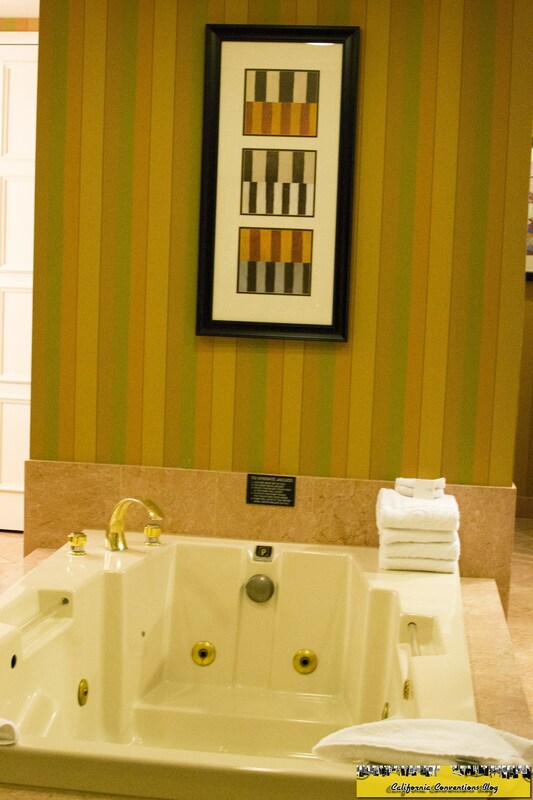 Back in the suite, it was a night of celebration, letting our aches and pains melt away in the jacuzzi, and resting up for the start of the convention.